*NEW FORMAT : Bring it with you anywhere! 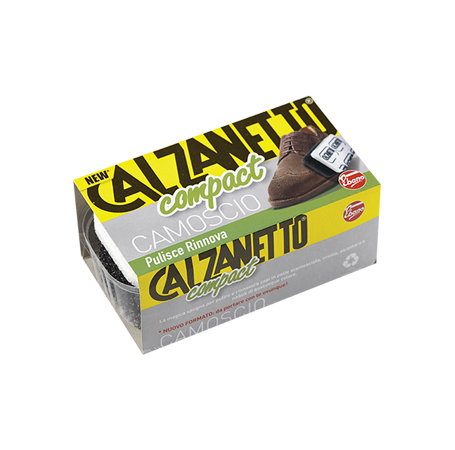 Thanks to its compactness Calzanetto Compact, you can easily take with them everywhere: in the car, in your bag, in your suitcase. Only our self-polishing sponge is soaked in refined high density silicone oils. A unique and incomparable formula, cleans, polishes and protects all leather objects in suede and nabuck, alcantara, etc. without color problems. Do not dirty your hands. The first and unequaled (over 69% market share). Soft grip that does not scratch the shoe. This product is also available in neutral and black. Take the sponge from the cardboard box without throwing it away (it will be useful in the future for keeping the product properly and recognizing it immediately). Remove the sponge from the transparent tray and brush the suede while applying medium pressure if there is caked mud or congealed dust, or light pressure when you only wish to raise the coat or dust the shoe. Smooth or polished leather, glazed, brushed, hammered/printed/kip, untreated light leather or "open grain", nappa, reptile. The soft expanded polymer allows Calzanetto Suede to remove caking and dust from suede and nubuck; at the same time as it raises the coat it permits the restoration of the original colour and allows the surface to breathe.